This course focuses on knowledge in 3D modeling with Rhinoceros and parametric design with Grasshopper. 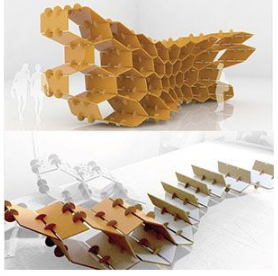 Thanks to digital fabrication tools, students can get real results with the construction of a large scale prototype as a final project. This intensive course is organized so that any student without previous knowledge in 3D modeling or Rhino may get a solid base for going into parametric design. For that, the course uses Grasshopper, a free graphical algorithm editor tightly integrated with Rhino’s 3D modeling tools. Unlike RhinoScript, Grasshopper does not require knowledge of programming or scripting for designers to build form generators, from the simple to the awe-inspiring. It is used at renowned architecture offices like Zaha Hadid and Norman Foster. Students will not only learn how to model and render but also will implement various strategies to obtain structures of complex models and to analyze, calculate, and interact with the physical environment. There will an opportunity to manufacture different models with CNC technology, like cutting laser Trotec and 3D printers. The final goal is to create, design and 3D model a cool object, prototype, or sculpture using Rhino and Grasshopper, get a fast render with V-Ray, and make it real with the digital machines.